Beautiful Shako from someone we all missed here! I recall you've wanted a T-Geweher for a while Gus. Wow! Great find and condition! Like most of us here, didn't know they had ersatz canisters too! Are you sure this isn't Gus's son? In the last photo, the young tiny officer looks like he's about to speak! Those vintage mannequins look definitely more genuine than the modern ones. Great job as always Karel! Which era would that conical hat be? Happens with both regular and photo posts. Topic: M 15 artillery Württemberg . Re: M 15 artillery Württemberg . Speechless! Looks like a completely different shell! Almost the same as your avatar. Love that M1902 Tropenhelm; congrats!! Too bad the crown was snapped off the eagle. Would you post more closeups including the interior? Thanks Ron. I can't see any maker's mark inside. - Would this have been worn by generals in all branches of the army (infantry, cavalry, etc.)? What a beauty! Thanks for sharing it James! - What Model is this? M1897? - I see rounded scales. Does this mean it's not Infantry? 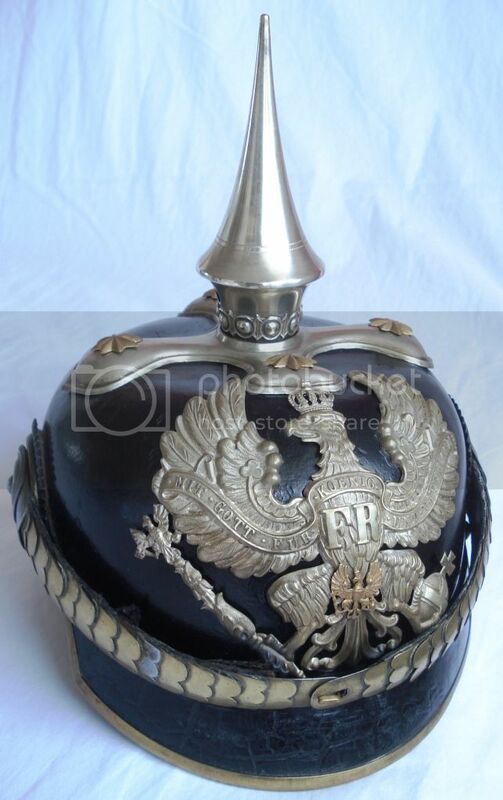 - What distinguishes a General's pickelhaube from a regular officer's? The fluted spike only? I hear you John. We all went through that. Out of curiosity, have you tried checking that white paint (skull + grenades) under a UV/black light? Unfortunately, the link has changed. Notice the captured RAF pilot toward the end? Enough with the teasing Ed!!! Looks fine to me. The interior even has that greasy spot towards the middle from the wearer's hair wax... Always a good sign as I once learned here! I always wonder why they don't mention or at least try to fix those discrepancies, especially when their asking prices are higher than most other dealers, and that's before taxes!